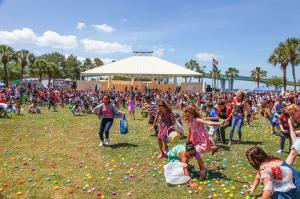 Approximately 8000 guests participated in last year’s Easter Egg Hunt in Coachman Park. The event is open to the community, providing family fun for all to enjoy. This year’s event will be held on Sunday April 21st. CLEARWATER, FLORIDA, US, March 28, 2019 /EINPresswire.com/ — On April 21 thousands of children and families will be in attendance at the 27th Annual Ginormous Easter Egg Hunt in Coachman Park in downtown Clearwater. Produced by the Clearwater Community Volunteers (CCV) and sponsored by the Church of Scientology, the annual hunt also includes pony rides, a petting zoo, face painting, train rides, gyroscope and bouncy houses. The hunt itself is free, and the small fees collected for the attractions are donated back to community charities. The park will open at 11am, with the scramble for 30,000 Easter eggs filled with 140,000 pieces of candy beginning at 12:30. Among the thousands of colorful eggs will be hidden 300 golden eggs. In addition to other attractions at the event, the Easter Bunny and his companion will be taking photos with families. Food will also be available for purchase. The event will run until 2pm. Ample free parking is available in the parking lot to the south of Coachman Park. To find out more information about the Clearwater Community Volunteers or the Ginormous Easter Egg Hunt in Coachman Park please call (727) 442-2099 or email ccvdirector@ccvfl.org.